"To advance through research, education and symposia, an increased public awareness of the Cape Fear region's unique history." and richly adorned with classical frieze treatments. schedule your 2 hour tour. Tours are $35 per person, minimum three persons. Custom individual tours are available upon request. 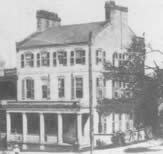 "Civil War Wilmington Walking Tours"
War Between the States (Civil War) era. No other tour is as unique and revealing! architectural development of this historic city. by the Sons of Confederate Veterans national organization. South, and preserving it for future generations. the States-era Forts Anderson and Fisher. and the battle for Wilmington in 1865. 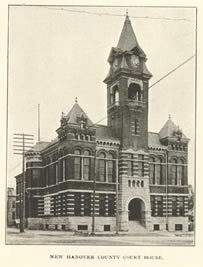 Wilmington "as it was" circa 1865.
email bernhard1848@gmail.com for more info. $25 per person, cash only, and we are dog-friendly. 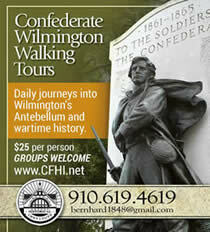 Wilmington walking Tours begin at the foot of Market Street. on request, also step-on services, please call for pricing. "The Defense of Confederate Point, 1865"
"The Historic Cape Fear Club and Its Founders"
"The Twilight of Independence, 1865"
"Confederate Memorial Day, Historic Oakwood Cemetery"
"General Hoke at Duplin Roads"
Artillery/Infantry reenactors, living histories, interpreters. Huckleberry Brothers Band, period musical entertainment. "Refugeeing from Wilmington: Families Fleeing the War "
Wilmington Blockade Runners to Canada"
"Parallels of Wilmington History: Colonial Thru 1865""
Prosperity Comes to the Cape Fear"
"Steamers Come to the Cape Fear River"
"Wilmington During the Secession Crisis: 1860-1861"
Memorial Day Address, Cross Creek Cemetery. "North Carolina's War Between the States Sesquicentennial"
Presentation by Bernhard Thuersam, CFHI Director. "Wilmington During the Secession Crisis, 1860-1861"
Lecture presentation by Bernhard Thuersam, DDirector, CFHI. "The South and America's Wars"
CFHI Information Booth & Period Reenactors. Please visit the CFHI Information Booth near the Hilton Hotel.